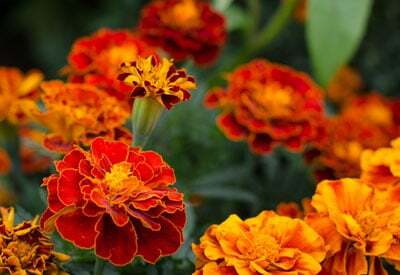 ​Easy to grow marigolds -- raised from seed -- provide a spectacular splash of color all summer long. Popular with gardeners coast to coast! Marigolds (Tagetes erecta) are one of the easiest — and most beautiful — annuals to grow. 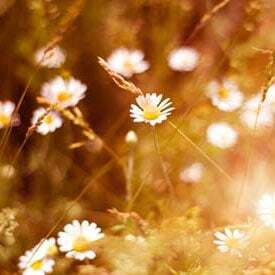 Compact flowers, ranging in color from pale yellow to deep orange and rust, make a spectacular addition to pots, baskets and borders or simply scattered throughout the garden. 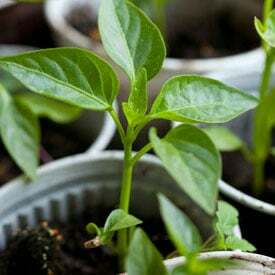 This quick germinator has a distinct spicy aroma and adds a splash of color all summer long. Looks great in dried floral arrangements too! Marigolds are not fussy and tolerate a wide range of soil and climate conditions, but most of all, they love heat. 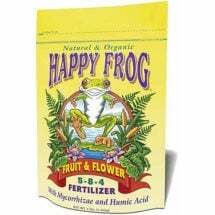 There are many varieties available of this cheerful garden favorite, from miniature to giant. Try growing marigolds in and around vegetable plants to repel insect pests. Hardy annual, 10-18 inches tall. 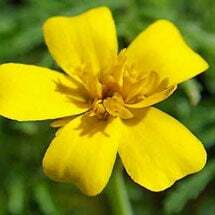 Fun Fact: In Macer’s Herbal, a 10th century manuscript on the healing properties of plants, marigolds were said to draw evil humours out of the head and strengthen the eyesight. Marigolds are not fussy and will tolerate most conditions. However, with rich, well-drained soil and plenty of sunshine, these plants will thrive. 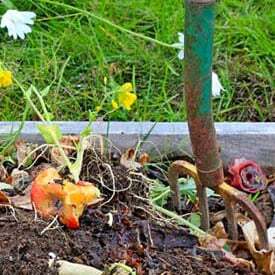 Generous amounts of organic compost or well-aged manure mixed into the garden prior to planting will greatly improve the health of flowers (see Springtime Garden Soil Preparation). Keep the soil moist, but not wet. Sow marigold seed directly in the ground and cover with a thin layer of soil (about 1/8 inch deep). Water thoroughly. Thin to 8-18 inches apart after seedlings have sprouted. Marigolds can also be started early indoors under grow lights for transplanting outdoors about six to eight weeks before the last frost date. Read our article Starting Annual Flowers Indoors to learn more. Once established and healthy, marigolds will continue growing easily, even if left unattended. Water to keep the soil moist. 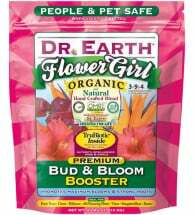 Provide nutrients monthly with a bud and bloom booster once plants have started flowering. Pinch off the spent blossoms to extend the flowering season. Mulch to prevent weeds, conserve moisture and improve aesthetics. Marigolds will not survive a hard frost or freeze. Marigolds have few problems with insect pests. 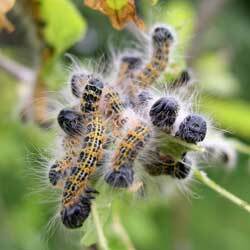 In fact, the flowers can be planted around cabbage and broccoli plants to help deter and repel cabbage moths. 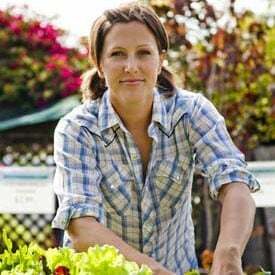 Read our Companion Planting Guide to learn how some plants perform better when grown together. 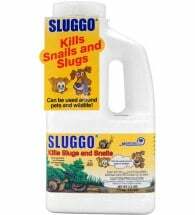 Keep an eye out for slugs, which can decimate the plants overnight. 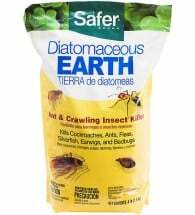 Monitor closely and treat with Sluggo® Bait or diatomaceous earth if damage is found. Spray soft-bodied pests, like aphids and spider mites, with a strong stream of water to reduce pest numbers or spot treat heavily infested areas with Safer’s® Soap for immediate control. Marigolds will produce lots of seed in a similar fashion to zinnia or calendula. When the blooms dry out, cut them off and hang upside down in bundles. The seeds are contained in the heads and, once dry and crisp, can be hand-crushed and winnowed from the seed chaff. What do you mean pinch off the spent bloom? It’s also known as deadheading or to remove the dead or faded flowers from the plant. 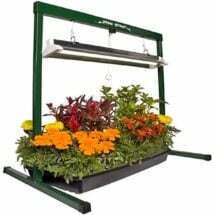 I am a keen hydroponics gardener and would like to plant marigolds in with my vegetable plants to help control pests. At what pH level should I set the gullies at?